Very private location with 400' of lakefront offering a sandy bottom with a gradual decline great for child or playing football in the water. Amazing views of Mt. Washington and Mt. Chorua. 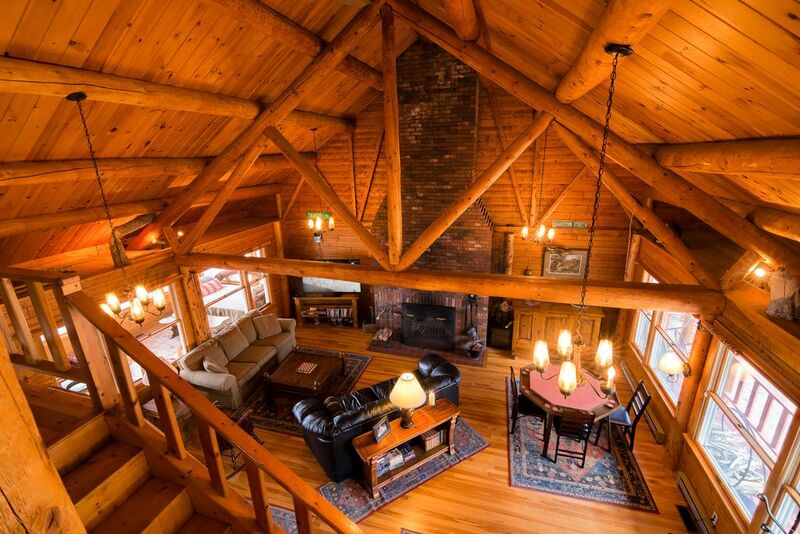 Authentic log construction with large interior timbers giving rustic appeal. Well appointed country kitchen and large beds in the private bedrooms add to make this home a comfortable stay. New stainless refrigerator, microwave oven, HE stackable washer & dryer and countertops installed in July 2011. Second full size refrigerator in Bunk House is available for additional food storage. Ceiling fan installed over loft beds adds to this property’s comforts. Half Bath located in the Bunk House is only operational in the Summer. Firm sand bottom, no grass! Ceiling to floor brick fireplace and log construction make the great room a pleasure to relax in. Very large front to back kitchen area is ideal for many cooks in the kitchen! There is ample space and counter areas for food prep. 2nd dining table is available in the 3 season room and can be brought into the kitchen area if more space is needed. Three kayaks, two single + one double, two standing paddle boards, and a two person canoe. We encourage you to bring your own linens. Great location, great host, awesome stay! Vicki and John's home is in the perfect location. The pictures really don't do it justice just how beautiful the property is. The house is very well equipped with everything you would need for a week long vacation and plenty of games and activities to keep us busy the whole time. Vicki was very responsive about any questions I had. Would highly recommend this place for anyone looking for a secluded and relaxing stay on Lake Ossipee. The house and location are perfect. The house is well stocked both indoors and outdoors with something to do for everyone. The view of the lake and the mountains is gorgeous. We had a great time and will certainly look to return! Thank you! Our family has been coming to Lake Ossipee since 1984 and we have rented this cottage over the past eight years. This is my family's favorite location! Beautiful lodging, views and very private. Absolutely amazing property and location. Pictures don't even do it justice. Overall we could not of had a more amazing experience. The location and amenities were more than our group could ever ask for. I have already recommended this property to friends and coworkers and I am looking forward to going back next year. Very nice family trip. Primarily we had two adults and three small children. House is well equipped and has a great blend of authentic camp feel with modern features. Bunk house is great for kids (and adults) to spend some time playing indoor games. Separate sleeping areas makes it easy for adults and kids to all get rest and privacy when needed. Back sunroom and deck have nice views and can play cards all night. Beach is terrific. Hard, sandy bottom and plenty of room to roam up and down the water. Quit dirt road. Owners are very easy to work with and accommodating. Tons of beach toys (kayaks, floats, paddle boards, soccer balls, etc...). Big TV with netflix is nice option for kids to watch a show when they need a break from swimming. Overall, very relaxing and quality family time. Just got back from a long memorial day weekend at this beautiful lakehouse in Ossipee. There's not many ways to accurately describe the view when you initially pull up the driveway to the house. It is breathetaking. We had a big group all together and it was a blast. The house was fine for all 10 of us and a couple kids. The house is very well maintained and the outdoors are so private and beautiful. Vicki was a great host answering the few calls I had placed about a few small things I wasn't sure about. This is a must stay for a weekend of pure solitude. We will definately be back! Travel down a private .5 mile road along the Lovell River to a secluded area in the Lakes Region of New Hampshire. Featuring spectacular Lake & Mountain views, your own private 400 feet of sandy beachfront just out the backdoor this property is spectacular. Complete with rowboat, 2 kayaks, 3 season porch, and outdoor deck. First floor includes master bedroom with king size bed, second bedroom with queen bed, full bathroom. Large spacious loft with separate sleeping area including six twin beds. Great room features 2 story brick fireplace, 2 sofas, poker table and bar. Huge country kitchen with dining area overlooking lake. Other amenities include a bunk house perfect for kids to campout in w/ a 2nd bathroom, ping pong table, air hockey, arcade game. Gas grill, beach chairs and a fire pit on the beach for campfires. Golf course and grocery store 1 mile off property. Jet-ski & boat rentals available from marinas on the lake. River canoeing and kayaking on property. The house is best suited for small families or three couples. Great for school age children, lots of open land to explore and a shoreline that offers soft sand and a gradual decline. Perfect for playing in. Thank you for your consideration.